"Change is Constant, Part 3"
In an alley, Casey Jones and Raphael beat down a purse-snatcher until he surrenders is ill-gotten gain. Unfortunately, their attempt to return the purse to the old lady it was taken from doesn’t turn out so well, as she runs off screaming at the sight of Raph. Casey brushes it off; they’ll just turn the purse in at the nearest police station. On the way, Raph asks Casey why he didn’t stand up against his drunken dad if he’s such a good fighter? Casey explains that when his mom died of cancer a year ago, she made him promise to take care of his good-for-nothing father and to not fight with him. Casey’s been doing his best to keep that promise. Raph then asks him about the hockey mask. Casey explains that when he graduated from high school, he got a hockey scholarship at New York Tech. Unfortunately, he’s currently on academic probation, though he needs the scholarship to pay for rent and food since his dad doesn’t work. Unbeknownst to either of them, some members of Old Hob’s gang are spying on them. Down in the sewer lair, Leo, Don and Mikey are busy sparring. As Splinter tutors them, Mike inquires just why Old Hob has been laying into them so hard, recently. Splinter tells them it is not their concern, as the past is the past. Fifteen months ago, after Splinter, the turtles and the ooze were dropped into an alley by ninja, a stray cat attempts to eat one of the turtles. Splinter and the cat get into a fight, resulting in the cat getting its eye torn out. As soon as the cat retreats, though, the ninja return for the bag they dropped. Splinter manages to pull the bag with the ooze and three of the turtles down a nearby storm drain, escaping the ninja. The next morning, Splinter awakens mutated into an anthropomorphic and intelligent state. Likewise, he finds the turtles have, as well. Back in the present, Leo, Don and Mikey head to the surface to search for their missing brother, Raphael, yet again. Tempers ignite as Don insists that they are never going to find him and should instead focus their energies on taking the fight back to Old Hob. Leo refuses such an idea, as they must follow their sensei’s command. The pair are about to go at it when Mikey breaks them up. Settling on a compromise, they agree to deal with Old Hob while searching for Raph. While eating hot dogs, Casey and Raph are bumped into by a pair of hoodlums on the run from the cops. Giving chase, they’re lured to a fenced-off dead end where they discover it was all a set up. Casey and Raph then find themselves cornered by Old Hob and his gang. 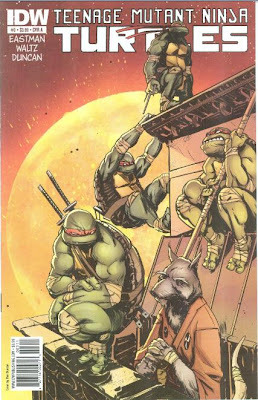 *This story is continued from TMNT (IDW) #2. The story continues in TMNT (IDW) #4. *The Turtles last fought Old Hob in TMNT (IDW) #1. *Casey's past will be show in greater detail in TMNT Microseries #6: Casey Jones. *This issue was originally published with five variant covers: Cover A by Dan Duncan, Cover B by Kevin Eastman, Cover RIA sketch version by Eastman, Cover RIB by Fred Hembeck and Cover RE exclusively for Jetpack Comics by Peter Laird. This latest issue of IDW’s new TMNT title has confirmed a few of my suspicions regarding a part of the Turtles’ origin I was a bit turned off about: the short span of time between their mutation and the present day (a mere fifteen months). I won’t repeat my criticisms of that plot point, as I laid them all bare in my previous review; I’ll just say that it might be an uphill battle for me to appreciate that decision. Ignoring that, though, issue 3 gives us a lot of action in the classic TMNT tradition. 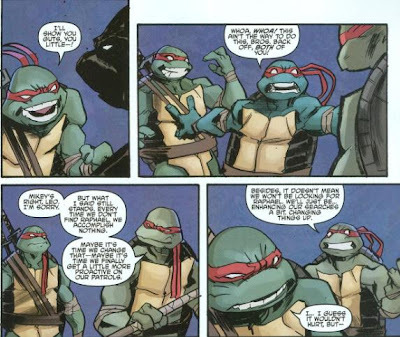 We’ve got the Casey/Raph team-up as they take their vigilante antics to the streets and we get the typical Turtle sparring match under Splinter’s watchful eye. All your standard Ninja Turtles material, so for anyone feeling put off by how “different” this series has been, you’ll probably find some comfort in this installment. Casey’s origin was delivered through a bit of hammy exposition, sure, but I greatly enjoyed that he actually received something of an origin or at least a back-story providing a necessary motivation. When he first showed up in the Mirage series, he was just a guy who liked beating people up with no pathos or inspiration beyond a love of Clint Eastwood flicks. As much as I love Mirage Casey, he was a fairly shallow individual for the first several years until story arcs like “Shades of Grey” and “City at War” decided to investigate him on a more cerebral level. Casey in the IDW series, though, puts his history on the table, giving us a clearer idea of where he’s come from and where he wants to go. 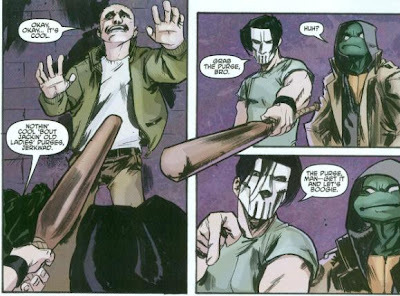 The idea of a Casey Jones that has actual goals and aspirations beyond just being a vigilante is practically uncharted territory, here. A college scholarship? Actual skill at sports? Casey here seems like much less of a loser than his other incarnations; more of a well-rounded, psychologically adjusted individual. And yet he’s still got all the necessary Casey-isms. College scholarship, sure, but it was for an athletics program; his lack of book smarts has landed him on academic probation. And he still comes from extremely humble beginnings and still has a drive to do the right thing and protect the little guy (or little old ladies), which doubles as a convenient means to let out his pent-up aggressions (mostly stemming from having to deal with a drunken dad). This is probably the most complex version of Casey we have ever gotten. And yes, that's even after accounting for "almost went pro before I hurt myself" and "Hun burned down my dad's store". As for the Turtles, I’m curious to see how this new timeline for their origin-to-present affects their relationships. They behave as though they don’t really even know Raph (having never met him since their mutation), which has me aching to see how they interact once the long-lost brothers finally meet-up. Will they immediately accept him? Will he want to be accepted? There’s definitely a catalyst brewing for Raph’s “outsider” attitude, and as with Casey’s back story, I appreciate that Waltz is making an effort to explain why characters behave the way they do and why they have particular personality disorders. Leo and Don butting heads was certainly… a new experience. With Raph missing, it almost seemed like Don was trying to take his place as “the Turtle that wants to get into a fight, disobey Splinter and argue with Leo’s command”. Don’s lust for battle almost seemed a bit out of character for the Turtle, though again, the circumstances at least provide a motivation for such behavior. I liked Mikey playing peacemaker between the two; that was definitely something he’d do. As for the next chunk of origin that’s been delivered to us piecemeal, well, it pretty much went down the way I expected: Splinter tears out the cat’s eye, infecting him with mutagen so he can become old Hob and then they all fall into a sewer and mutate. Nothing bad about the way it was done; just kind of telegraphed, that’s all. 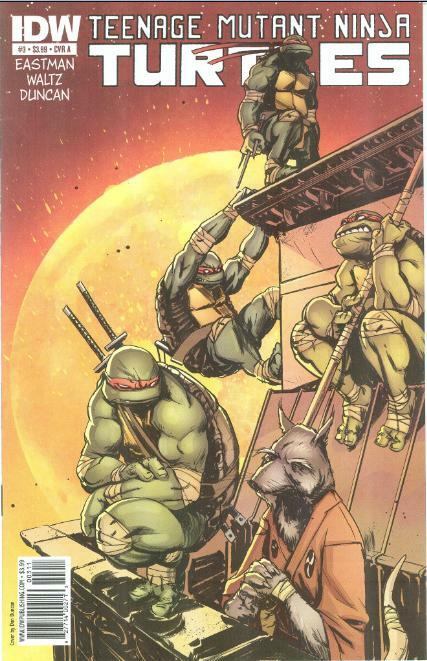 The Turtles growing into teenagers immediately, while it fits the fifteen month timeframe, it eliminates the idea that Splinter raised them as his children; a family dynamic I always felt was essential. They call him “father” in this issue, sure, but he’s only been their “father” for scarcely more than a year. The third issue was good, though perhaps not as exciting as the previous one. The Bendis-style decompression is starting to eat away at me, too. I’m digging the story and I can tell that Waltz is setting a lot of ideas up well in advance, not just for plot but for characterization, but this definitely reads like it was “written for the trade paperback”; a popular contemporary style of writing that’s cool if you wait for the trades but not so much if you’re sticking to the floppies. I liked seeing Donatello with a bit of an attitude. As the smartest of the group (though not necessarily the wisest), it makes sense that he would be prone to thinking for himself (anti-authority) and try to persuade his brothers to see things his way through some clever logic and rhetoric. Raphael has yet to show any evidence that he's a hot-head in these 3 issues. It seems like he's just prone to be a loner and a roamer. It will indeed be interesting to see how he's able to adjust to being back under Splinter's authority and a peer of the other 3 turtles. I really enjoyed reading this issue, though I do share your stated concerns about the family dynamic and training regiments given the accelerated time frame. I totally agree with you. 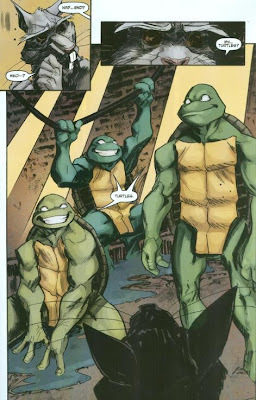 The idea that splinter raised the Turtles as 1-year old baby turtles to present day was what made me believe that they were a family. However, my main concern is if they've totally done away with Splinter's connection to Yoshi and the Orokus. That piece of history I believe is essential to their ninjutsu and Splinter's history. I truly enjoyed this series so far, and am stoked about how it will play out. I love the Turtles as a 2-year old, and am currently 22... that's a lot of years! So you can expect how excited I am about IDW picking up the series and retelling the stories through their eyes (not to mention Eastman on board) has me confident that they'll be faithful and do the Turtles justice.